What are the Glass Memorials constructed from? 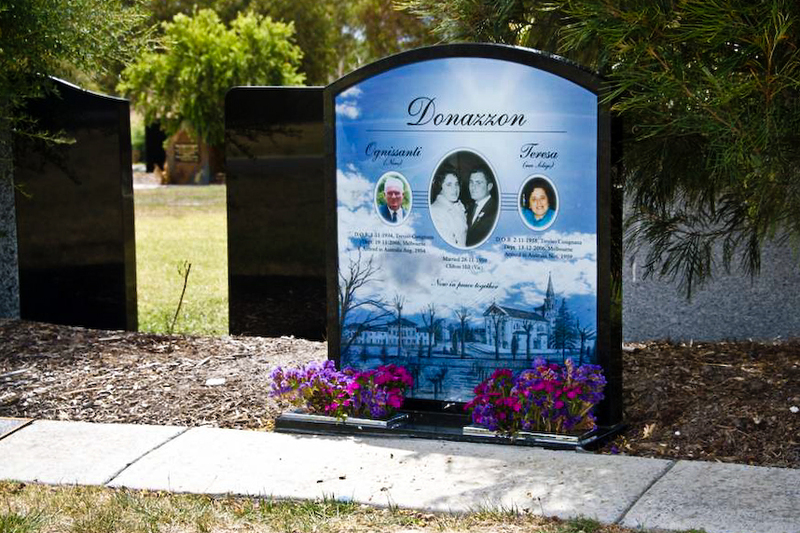 Life’s Memories memorials tributes are made using a special printed interlayer incorporating world patented colorfast Ink Technology laminated between two pieces of glass. The thickness of the glass can vary with the size of the plaque and toughened glass can be ordered if required. Does the glass need special protection? No special protection is needed once installed. Being manufactured from glass, Life’s Memories memorials are waterproof and are as durable as the windows in your house or motor vehicle. Life’s Memories memorials have similar performance criteria to your laminated car windscreen. How long does it take to make the glass memorial? It takes 6 weeks from acceptance of a proof, which you will be shown. A detailed description of the process is provided in the ‘How to Order’. Is it possible to personalise the memorial? A scientific light fastness test is on-going. By April 2005 and after completing ten years in extreme conditions it was not possible for the human eye to detect any variations in the image. Click here for more information. Can I use a photo as a background? In a Standard Memorial you will be able to select from an image library for your background. With a Designer Memorial you can provide your own photograph or image which a graphic designer will incorporate into the background. Do these memorials come with a guarantee? Life’s Memories Pty Ltd warrants that the glass outer layer of Life’s Memories glass memorials will withstand normal weather conditions for a period of ten years. How should I clean it? Will it scratch? Treat your Life’s Memories memorial as you would your house or car windows. Clean using a clean, soft cloth with warm soapy water and methylated spirits or Windex or similar. Do not use harsh, abrasive chemicals or sharp objects as these may scratch the memorial the same as they would your windows. Will we see the sample of the memorial before the final production? You will be provided with a printed or soft copy of a simulation of the final design and will be asked to carefully check spelling and sign it as a means of authorizing production to commence.